For those not familiar with Insignia, it is the “house brand” for Best Buy. The TVs themselves are built by various manufacturers for Best Buy and then rebrand for sale with the Insignia label. For this specific model, it comes with the Fire TV experience built-in and includes a voice remote with Alexa. The Voice Remote with Alexa lets you do everything you’d expect from a remote—plus, easily launch apps, search for titles, play music, switch inputs, control smart home devices, and more, using your voice. With Fire TV, you can add apps like Netflix, Prime Video, Hulu, HBO, SHOWTIME, STARZ, and more. Dimensions (W x H x D): TV without stand: 48.9” x 28.6” x 3.3”, TV with stand: 48.9” x 30.3” x 10.4”. Multiple device input/output options: 3 HDMI including 1 with ARC, USB, composite input, antenna/cable input, digital output (optical), audio output, Ethernet. 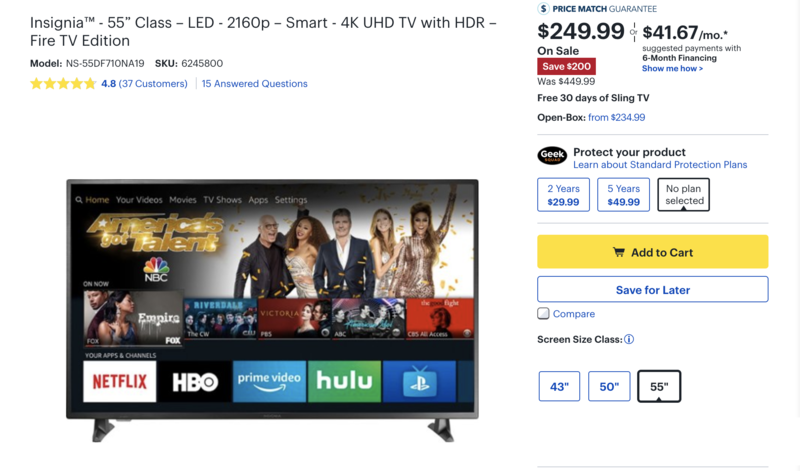 Keep in mind this is the Best Buy deal of the day for Sunday 11-18-18, so if you are thinking about getting a 4K TV, don’t think too long as this offer is just for today. **This is NOT a sponsored post. Tech Geek and More does not have any association with Best Buy, and has no financial (or any other interest) with them. This post is just to alert the readers of Tech Geek and More about a deal they may be interested in.